Craft beer production shows little sign of slowing in the latest mid-year numbers released by the Brewers Association today. 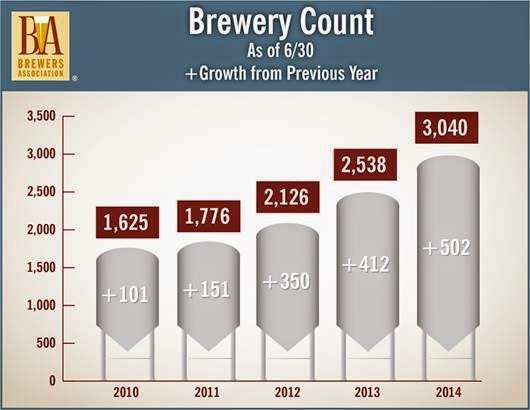 Check out all the latest stats on the craft beer industry for 2014 so far. [PRESS RELEASE] Boulder, CO • July 28, 2014—Small and independent craft brewers enjoyed continued growth in the first half of 2014, according to new mid-year data released by the Brewers Association (BA), the not-for-profit trade association that represents the majority of U.S. breweries. American craft beer production volume increased 18 percent during the first half of the year. From January through the end of June 2014, approximately 10.6 million barrels of beer were sold by craft brewers, up from 9.0 million barrels over the first half of 2013. (Note: The 18 percent growth rate is based on the updated craft brewer definition1 and derived from comparable barrel total from the first half of 2013. 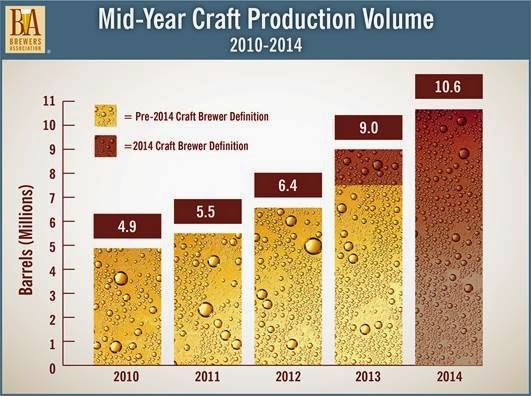 Mid-year figures first reported in 2013 were based on the previous craft brewer definition). As of June 30, 2014, 3,040 breweries were operating in the U.S., 99 percent of which were small and independent craft breweries. Additionally, there were 1,929 breweries in planning. Craft brewers currently employ an estimated 110,273 full-time and part-time workers, many of which are manufacturing jobs, contributing significantly to the U.S. economy. Note: In February 2014, the Brewers Association Board of Directors approved changes to the craft brewer definition that go into effect with the 2014 craft brewing data set. 1 An American craft brewer is small, independent and traditional. Small: Annual production of 6 million barrels of beer or less (approximately 3 percent of U.S. annual sales). Beer production is attributed to the rules of alternating proprietorships. Independent: Less than 25 percent of the craft brewery is owned or controlled (or equivalent economic interest) by an alcoholic beverage industry member that is not itself a craft brewer. Traditional: A brewer that has a majority of its total beverage alcohol volume in beers whose flavor derives from traditional or innovative brewing ingredients and their fermentation. Flavored malt beverages (FMBs) are not considered beers.